WARNING: This review may contain a few spoilers to those who have not read the first book in this series. The first half of this review will be for those who have not read the first book in this series where I will do my best to withhold any information that might spoil the book for you (as I do hope you will consider reading this series because it is AMAZING). The second half will be for those who have read the first book and would like a more in depth review of this book. Please read at your own discretion. Gosh, where do I begin? Well let's see..... This book has made me curse, scream in agony, cry, and has left my heart and sole in a state of confusion as well as longing for more. The worst part about it (or should I say the BEST part) is that I loved and relished in every second of it. The story kicks off as Sophia continues to pursue power and control of Russia even as her life is threatened and one obstacle over another tries to make her falter. 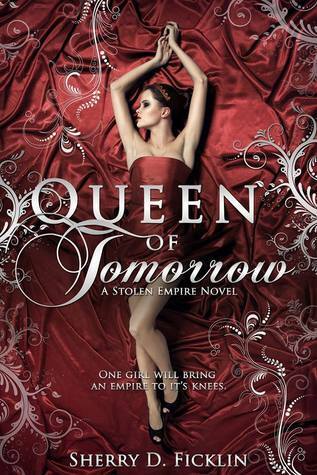 Queen of Tomorrow leaves behind many of the old conflicts of the first book and deals with the bigger problems now at hand with a war breaking out, alliances forming, and the question of who will be the next in line for the throne are raised. The plot in this book and whole series really has so many dimensions to it. Every character, their motives, and every relationship is complex. Oh and do not even get me started on the romance! The love scenes are beautifully done and they can get pretty steamy. You will feel ALL THE FEELS (If you know what I mean). The chemistry between characters leaves you desiring them to be happily together, but then conflicted as you realize how their relationship affects the other characters. You never are sure where the story will go and you are left to ride along and watch it all unfold. The protagonist Sophia (aka Catherine) is such a strong, intelligent female character. She faces many hardships, but still is able to use her wit to save herself and those she cares for. She is tested in every way possible, but she still remains true to her roots, virtues, and pride. Sophia is definitely one of the best female characters I have read in the YA genre and one I highly respect. This book is able to take the glamour of royal life to the next level by portraying what actual takes place behind all the riches and fairy tale lifestyles. As for the cons of this book, there are none known to me. Forget how the first book left you feeling about each character because Queen of Tomorrow will give you a whole new perspective of them. Characters like Sophia's husband Peter and the Queen are two I have hated from the very beginning. As for the Queen, I still continue my strong dislike towards her, but Peter throughout the novel revealed aspects of himself that pleasantly surprised me. At one point I even wished a love would rekindle between he and Sophia, but let's just say I quickly got over that and have gone back to hating him. Sergei and Sophia's love for each other gets to blossom and all along the way many surprising events unfold that will leave you engaged until the very end. I just love how Ficklin again ends the book with Sophia as strong as ever and leaves me greatly anticipating the next installment. This was the perfect sequel to the already wonderful Queen of Someday and I am eager to see what else Ficklin has in store for us. Thank you to Clean Teen Publishing and Xpresso Book Tours for allowing me to review this book. Great review, it's been a while since I've read a series. This one looks good and your review makes me know exactly what to expect. Thanks and I hope you decide to try it out. The series is really good! I heard great things about this one. I need to read the first book soon! Great review! Yes you really should! It's great. Thanks! Yes it was a stressful, but great book. I hope you try it soon.